David Clarke, a humorous man, mentioned a chat he’d had with Mick Craven, like him an Australian married to a markedly attractive South African woman and settled here in the Cape. They’d agreed, said David, how lucky they were that South African women had such poor taste in men…. Valid point or not, we others are grateful to their wives, and lucky and pleased to have them both here (Australian or not). Jeanine and Mick Craven of Craven Wines. Mick and David were both at a tasting in Cape Town earlier this week – David the innovative, energetic wine distributor and organiser of the event, Mick taking the lead in presenting the 2017 Craven range, with quiet interventions from Jeanine. Mick still has a day job at Mulderbosch, Jeanine, also a qualified and experienced winemaker, now concentrates on kids and vineyards. Lukas van Loggerenberg, resolutely South African (though Rawsonville must sometimes seem a long way from where he is now), was also there presenting his wines – of which more detail some other time. It was actually a very interesting pairing, with enough similarities and differences between the producers to allow for some mutual illumination. Both winemaking teams defer to the vineyards that produce the grapes and avoid mucking around with the grapes in the cellar – only older oak, no over-working, no additives apart from some judicious sulphuring. I did come to realise one significant difference, actually, in relation to the vineyards: Lukas has picked and chosen all of his, while the Cravens have, for many of their wines, had effectively less choice – firstly, because they’ve elected to limit themselves to Stellenbosch; secondly, because they wanted to make wines from pinot gris and clairette and there wasn’t much choice; thirdly, because they wanted to use some grapes off Jeanine’s family farm in the Faure area. That last point is only possibly problematic for their Pinot Noir (about R230 per bottle), which reportedly comes off quite badly virused vines, something which no doubt helps to contribute the touch of dour leanness to the wine, though there is enough fruit. The Cravens are also devoted to early picking (this wine has just 11.7% alcohol and is nicely fresh) and to whole-bunch-pressing (accentuating, I should think, the tannic structure); all of which probably contributes to what I found as the slightly hard work involved in drinking this wine. No trouble with the Faure Vineyard Syrah, however, which is more luminous and expressive, more perfumed, complex and balanced than the darker-fruited Firs Vineyard version (the alcohol of which is a bit lower, at 12.4%). Looking back on my notes for the 2016s, I see I preferred Faure then too. Identically made, again with all the stalks intact, with least possible intervention – just a touch of sulphur. But these are both still very young and unsettled, so the battle between them is not yet over. Also around R230. I wonder if it’s a coincidence that my favourite of the reds is the Cinsault, which was the only one that’s 100% destemmed, and also the most vinous (with the highest alcohol at 12.8%). This is a lovely example of non-trivial cinsaut, with some aromatic, fruit-rich charm but also a savoury, slightly earthy character. More acid than tannin in the attractive balance. Dare I say it’s a nicer pinot than the Pinot? Extremely pleasing wine, anyway, now and for a good few years I should think. About R200. Which ain’t, of course, cheap. Nor are the whites. The Cravens have become the go-to people (there’s not really a lot of choice) for clairette, and there’s good reason to go there. The lightly perfumed 2017 Clairette Blanche is made with a skin-fermented component as usual, adding not only flavour but a pleasing tug of tannic grip to the sweet-sour character. Very fresh and lively and drinkable. As is the Chenin Blanc Karibib Vineyard, with ripe varietal flavours and a satisfying weight and texture; again, perhaps it’s the extra degree of alcohol (at 12.5%) over the Clairette which makes me find this the more thoroughly enjoyable wine. At around R200, it’s a bit more pricey than the other two whites. As usual the Pinot Gris, fermented on its red (“gray”) skins to make it very rosé-like in appearance, reaches even headier levels of alcohol – a stratospheric 13%! Also as usual, it has a definitely bitter element for me (the Cravens say that they both have a high threshhold when it comes to perceiving this character), though less bitter than last year’s, which I found rather excessively so. Boiled sweet aromas, light and pleasingly textured. And with no shortage of character – like all the Craven wines. I see that I’ve actually conveyed the wrong impression about Jeanine’s role in the Craven operation, which is bad of me. In fact (apart from the talking!) 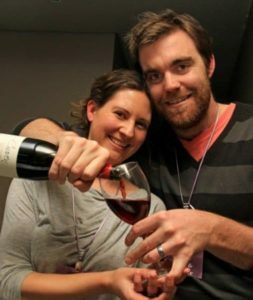 she is the leading partner in running the business and in the winemaking, which is why she left her full-time job. I suppose I stressed the vineyard side of it because Mick mentioned that she has to do much of the vineyard work because she’s available during the day when he isn’t. Another bit of carelessness in writing this piece was originally to misread the prices I was given; they were RRP, but I thought they were trade prices, so added on 30%. This was corrected fairly early (those showing now are the right ones), so I hope it didn’t do too much misleading – the correct prices are, in fact, pretty reasonable as things go for the small new-wave producers.